« Come in a little closer . . .
A few months ago we showed you a mainplate from a watch that had somehow come to be damaged through severe mishandling. Today, we’re going to show you another damaged mainplate. This time, from a modern watch calibre, whose mainplate was damaged through a combination of poor engineering, overuse, and lack of service. The mainplate serves as the very foundation of a watch movement. It’s arguably one of the most robust components in a movement and, relatively speaking, it’s not an easy thing to break. More often than not, when damage is done, it is not easily undone, and the mainplate will either need to be rebuilt or replaced entirely in order for the timepiece to function properly again. If you take a close look at the comparison image below, you will notice a tapered area, in the mainplate on the left, that has been worn away into a rectangular recess in the mainplate on the right. A small, but significant difference that resulted in the quick-set mechanism of the watch, for the time zone and date, to be inadvertently engaged while in the neutral crown position. The watch that this mainplate was in features a screw down crown to improve the watch’s water resistance. 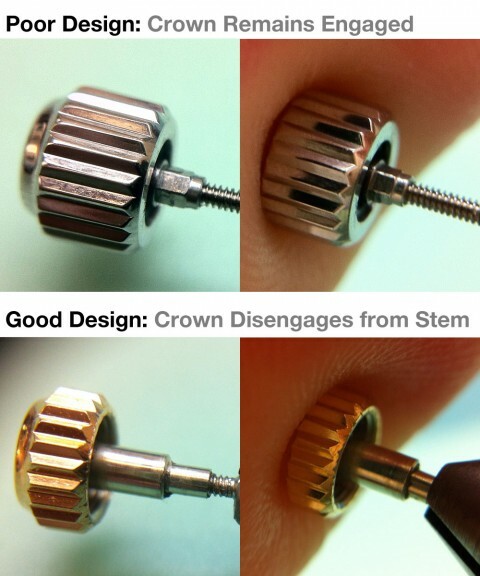 Most screw down crowns are designed to disengage from turning the stem (and thus keep from winding the watch) while the crown is being screwed down onto the watch case. This prevents undue stress from being applied against the components of the winding and setting mechanism while those components are in motion. The style of crown in this particular watch, pictured in the top of the comparison image below, is not designed to disengage. Thus, every time the crown was screwed down, the stem continued to turn while simultaneously applying pressure against winding pinion. The winding pinion also continued to turn, driven by the sliding pinion being turned by the stem. 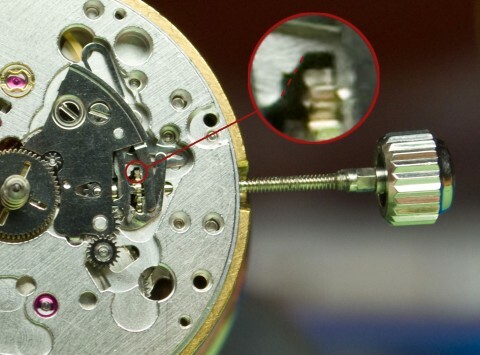 This combination of pressure and turning action of the winding pinion against the mainplate effectively created a miniature radial saw that cut away at the mainplate until the watch no longer functioned as it should. In this case, the quick set mechanism would engage and alter the date/time each time the crown was screwed down. Thanks to Al, from Archer Watches, for sharing some of his photos for this post. This entry was written by J.Edwards and posted on November 12, 2012 at 5:36 pm and filed under watchmaking. Bookmark the permalink. Follow any comments here with the RSS feed for this post. Post a comment or leave a trackback: Trackback URL.